Christmas is the most exciting day for the year, according to a recent informal survey of Kids We Know (and quite a few adults). And December 1st kicks off a super-busy, giggly, event-filled 25-day countdown. Advent calendars have changed since German Lutherans began marking doors and lighting candles each day. 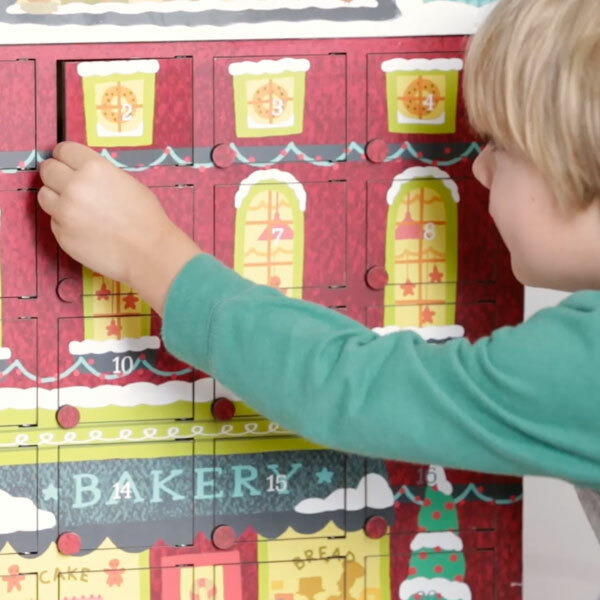 The first commercial Advent calendars were made of paper, with little doors to open every day. We love those—and we’re big fans of the kind that let you add a little something extra in pockets or boxes or cubbies. Candy and tiny toys and trinkets are always favorites. And if you’d like to go a step further—either on special days or all 25—we’ve got some ideas for your Advent calendar. And check out some ideas in action in the video below. Art and craft supplies: rubber stamps, beads, crayons, markers, etc. We like the idea of alternating “little things” with “bigger things” so there’s room for creativity, but no pressure to come up with something awesome—or spendy—every day. If you’re looking for more involved alternatives to chocolate, here are some ways to mix it up. Activity hints: Tuck in a miniature ornament the day you’re going to get the tree, a tiny cookie cutter for baking day, or a packet of cocoa for movie night. Notes from the North Pole: Pass along messages from Santa, Mrs. Claus, or that helper who watches your kids from the shelf. Pieces and parts: Add a handful of puzzle pieces, or a few plastic bricks, or other components of a bigger project. Love notes: Write a little note about something you love about your kid for them to open every day. Build anticipation for kids’ favorite family activities—from picking out the tree to movie night. We’ve got a free printable list of fun holiday ideas (and even more activities here), or you can brainstorm your own with your family. That way the kids can help choose what to do—and you surprise them with when to you’ll it. Say thank you to a teacher. Making treats for a neighbor. Help your brother or sister. Print the Christmas story from the Bible or A Visit from St. Nicholas line by line or verse by verse on small pieces of paper, and let it unfold as the days go by. You can practice memorizing lines and verses each day. Or talk about their meaning or unfamiliar words: Where is Bethlehem? What is a “heavenly host”? Are “sugarplums” edible? How does one “throw up a sash,” and is it as icky as it sounds? Or make your own! We’ve got easy-to-make ideas for crafters at any skill level. Use boxes, bags, or milk cartons to hold advent treats, or make pockets to hang on the tree. You can also count down the days with a paper chain—we’ve got fun twists for turning it into a family tradition.